Standing tall in China – So where are you now? My formal debut as a tourist attraction took place in Beijing about 15 years ago. I was on a business trip with my then supervisor, who decided it would be a shame for me to spend my entire first visit to China in meeting rooms and fancy restaurants – and subsequently requested our government host to organize a day of sightseeing for me. I felt a little guilty that I might be shirking my professional responsibilities, but it had been an intense trip and I was honestly eager to have a break and just play tourist. A car was sent to collect me from my hotel quite early in the morning. The driver and I had no common language, but thankfully our host had thoughtfully organized a university student to serve as my companion for the day. Her English was not stellar, but when she proudly informed me that her English nickname was “Friend” I figured I was going to be in pretty good hands. The plan for the day was ambitious yet exciting. 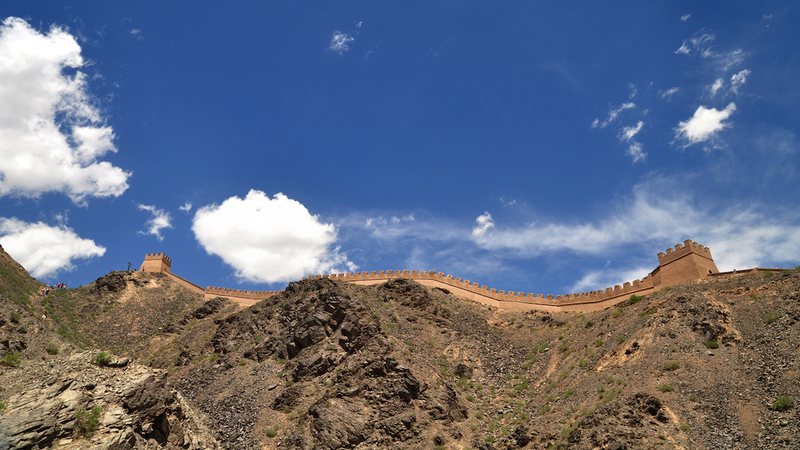 We started by driving a few hours to reach one of the sections of the Great Wall within the general Beijing vicinity. It seems that a few thousand others had had the same idea that crisp spring day, but somehow standing atop the behemoth structure surrounded by throngs of people just intensified the experience. We then piled back into the car to return to the city, where we enjoyed a traditional lunch…of Domino’s pizza. I would have preferred some more of the fabulous Chinese food I had been sampling, but my new friend Friend’s effort to take me someplace I would feel comfortable was so kind that I just smiled and tucked in. The wall-walking – which was more strenuous than I had imagined – had certainly helped me to work up an appetite. The afternoon was to be spent visiting Tiananmen Square and the adjacent Forbidden City. Upon our arrival, I felt pretty overwhelmed. The square itself is massive, ranking as one of the largest in the world. It’s a space of both cultural and historical significance, although like many Westerners for me it’s hard to separate it from the 1989 massacre. I was standing there drinking it all in, the reality of China and all that it stands for finally hitting me. The Great Hall of the People, Mao’s Mausoleum, the Monument of the People’s Heroes, the entrance of the Forbidden City…it was almost too much. And that’s when I heard a vehicle pull up behind me. The luxury coach bore several signs in Chinese, so I assumed it was a group of domestic tourists, likely from another part of the country. When the doors opened and people started pouring out, my suspicion seemed to be confirmed. I hadn’t even had a chance to smile or acknowledge them with a pleasant nod when a middle-aged woman pointed at me and started yelling loudly to her companions. I started looking around, trying to figure out was happening; was the Forbidden City on fire? Had the Rolling Stones just arrived? When I swiveled back around, however, I realized that the shouting woman was standing at my side, patiently waiting as a man set up his rather large and professional-looking camera a few meters in front of us. When I noticed that everyone else from the bus had formed a queue, I finally put it all together: We were about to have a full-on photo shoot. For the next 20 minutes, I stood there as the 50 or 60 tourists posed by my side. I tried to keep a smile plastered on my face, but by the end I was indeed getting a bit weary. Interestingly, none of them tried to engage me, thank me, or even really acknowledge me at all; it was as if it were my job to model with them, like a costumed character at Disneyland. Friend, who had watched the whole thing from a few paces away, seemed to not know what to say when we were finally free to continue on our way; my sense was that she was embarrassed about what had happened and perhaps felt bad that she hadn’t done anything to intervene. I assured her that no damage had been done, and all was soon forgotten as we immersed ourselves in the world of Imperial China within the walls of the Forbidden City. In many ways, I did understand the group’s curiosity. As a 6’3”/190 cm woman with red hair, blue eyes, and freckles, I do look a wee bit different than the average Chinese person – or Asian in general, for that matter. I’ve indeed had many similar experiences in other parts of the continent in the intervening years. One of the most memorable was being on the historic Thai-Burma “Death” Railway and having all of the Thais in the packed train car take turns snapping photos in the seat next to me, giggling as they tried to outdo each other with their poses. Most recently it happened in Sri Lanka, when the (rather short) man running the till at the hole-in-the-wall restaurant where I was having lunch asked me to “Take selfie?” – which led to all of the other employees getting in on the act. What the hell, I figured. If it somehow brightens their day, what harm does it really do me? On a deeper level, though, the whole phenomenon has given me a better understanding of the concept of objectification. Although I generally don’t think that people who want to pose with me have any nefarious intentions, it’s somewhat unnerving to realize that at that moment they are viewing me more as a thing than as a fellow human. In essence, the desire for a photo that will make their friends laugh or gasp in amazement trumps any consideration for how the situation may make me feel. It’s given me real empathy for everyone who endures cameras being stuck in their faces when they’re trying to lead their daily lives, whether they’re celebrities, tea pickers, or simply women carrying firewood on their heads. When you start being treated as a public good, your own feelings become secondary – or even completely irrelevant. And take it from me, that’s not the nicest of sensations. I’ve made my peace with being a walking tourist attraction and now even occasionally photo bomb tour groups if I see jaws drop as I walk by; celebrating our differences as humans can truly lead to good fun when it’s done in the right spirit. But if you’re someone who likes to take photos of people during your travels, please do take care to remember the right spirit bit. A camera can be used as a wonderful tool to bring people together, just as easily as it can be used to completely dehumanize someone. A smile, a nod, a few words in the local language, or a gesture to indicate that you’d like to snap a pic will go a long way and likely make the encounter a lot more enjoyable for everyone involved. In fact, the memories of the interaction may become more valuable to you than any of the photos you subsequently take. Whew. 🙂 I hope you’re keeping well and enjoying your time in China, Ms. Sharron!! 1. Our daughter the tourist attraction. Interesting! Fun to imagine in how many hundreds of photo albums you are pictured. 2. Enjoyed this particular blog entry very much. I knew generally about your experience in China, but not all the details . . . or perhaps I’ve just forgotten. 3. This time I did receive Email notification of the entry. Thanks on all counts, Bets. 🙂 I’m really glad you enjoyed the piece and am glad the email notification system is working now. Love you! …but will you be in my entourage? 🙂 Thanks for the reminder re. limits. Hugs to you across the pond, Dippy! Such a great post – and your point about objectification is spot on. I remember feeling that way when living in Japan (the constant pointing and yelling of “gaijin! gaijin!”), but perhaps not being as patient as you are! Thanks so much for the comment and great feedback, Wendy! I’m really glad you liked the piece and appreciate you sharing about your experience in Japan. I recently got into an interesting discussion in a Facebook group about terms like “gaijin,” “mazungu,” and “farang” — which can admittedly be an easy way to describe someone but can also really lead to a sense of both alienation and objectification, with the person using the term not even realizing it. It’s really all a fascinating area of inter-cultural interaction, isn’t it? Hugs to you in NZ! Great post, Sarah. I went through the whole “gaijin” thing in Japan, as well. The best was when we were stopped on the street in Sapporo by some (apparently) well-known Sumo wrestlers and asked to pose for pictures with them. The saddest part is that this happened in 1991, and I have no photos of my own to commemorate the event . I love the image of you posing with sumo wrestlers — and can imagine there were many laughs all around! We could be quite a team if we travelled together, eh? 🙂 Thanks for sharing that story and the positive feedback, m’dear! Sarah – wonderful post that turns our tourist ways back on ourselves. I’m pretty sure I’ve never been quite as brazen in my photos as the tourists you describe, but your words will stick with me as I continue on my nomad journey. Heaps of thanks for the great feedback, Julie, which truly means a lot — especially from a sister nomad. 🙂 I really like how you frame it as “turning our tourist ways back on ourselves,” which seems not only appropriate in this particular context but also like generally a good thing for us all to do from time to time as a way to keep ourselves in check. I find that sometimes despite having the best of intentions, I can get caught up in the moment and do or say something that I later realize was, well, more ugly tourist behaviour than I thought at the time. It’s really such a process of learning, isn’t it? Thanks again, and may the road be good to you this spring!! Your parents’ friend poet Bill Holms talked about the same experience in his book Coming Home Crazy.